For years I have enjoyed all sorts of fantastic sci-fi stories dealing with gargantuan machines. My enjoyment of the television series Zoids: Chaotic Century and numerous Transformers TV series attest to this interest. What makes these stories so compelling? Why do so many people go bonkers over stories dealing with huge machines/metallic beings? With the Transformers franchise, the answer is simple enough: the Autobots – when they are dealing with humans, specifically young ones – take the place of imaginary friends. After all, who hasn’t had an imaginary friend at some point in their life? Who doesn’t want one when they grow up? Imaginary friends aren’t the type to criticize, and they’re always sympathetic to the person who ‘creates’ them. Zoids also has a simple answer. There are cultures the world over with stories of people bonding with animals, sometimes called ‘spirit animals,’ who gain power from such a bond. Scholastic Publishing has even begun producing a book series based on this idea. But why go in for ‘spirit’ animals when you can pilot your own ‘mechanical combat unit’? (That was New Century Zero’s description of a zoid.) If my ears do not deceive me, I just heard the balance scales clunk to the table; the zoids have outweighed spirit animals in one fell swoop. When it all comes down to it, these franchises are popular because the mechanical beings in the stories are powerful. And let’s face it: most everyone has some measure of fascination with power. This is only bad when the attraction becomes a full-blown obsession that leads to unpleasant things. It is definitely a fascination to be treated carefully. Hence the absorption so many people have with these stories. The premise for the movie sounds less bizarre when one learns that the director for this film, Guillermo del Toro, cited the original Godzilla movies as part of the inspiration for the plot. Having seen some Godzilla films (from the sixties, a few from the seventies, and at least one from the eighties..?…I never got the line-up sorted out properly. ), I can see where Pacific Rim appears to have been influenced by them. The film has the feel of a Japanese production to it, not least because of its lead actress, Rinko Kikuchi. There were two things – well, three, but we’ll save the third one for another day – which struck me about the film. One was the Jaegers; these were the huge, monster-killing robotic exo-suits of the film. The story in the film begins with an inter-dimensional rift opening in the Pacific Ocean (hence the title ‘Pacific Rim’); this portal is a gateway between Earth and a dimension of very ugly aliens. The aliens, dubbed Kaiju (the Japanese word for large monster/huge beast), attack and wreck everything along the Pacific coast of the countries bordering the Pacific Ocean. They don’t attack all at once. First one Kaiju shows up in San Francisco. It takes several long days of fighting by the woefully outmatched U.S. military before the monster is killed. (Yeah, right. Feed the darn thing a couple of ICBMs and it is toast in minutes.) Then another Kaiju shows up some days later. And another. And then another. Pretty soon, the world figures out that the Kaiju aren’t going to stop coming. Jaeger is the German word for ‘hunter,’ and this was another detail in the film which hinted at its Japanese inspired nature – for me, at least. One of the zoids in New Century Zero (see my post ‘Ready…FIGHT!’ for more details), had interchangeable armor including one armor change built for supreme speed (think super-sonic) which was called the Jaeger armor. Ironically, that armor was also blue, just like the armor for the most prominent Jaeger suit in the film. This aspect aside, the second element of the show to catch my attention was the ‘Drift.’ According to the story, the Jaegers are too large for a single pilot to manage on their own. Those who tried to pilot the machine solo came away from the experience damaged. Although it is never made entirely clear in the introduction of the movie, it is implied that some of these initial test pilots suffered severe neural damage during their attempts to pilot a Jaeger solo. So Jaegers cannot be piloted by a single person. To get around this problem, the builders for the Jaegers designed a ‘neural handshake’ or ‘Drift.’ This mechanical device links two people together mentally; one person manages the left side of the Jaeger, the other controls the right side, while both people share thoughts and memories through the connection. In essence, you have two people acting in the capacity of the two halves of a human brain while piloting a Jaeger. There’s just one thing about this bond, one little snag. These two pilots have to be mentally compatible. Pilots who aren’t mentally compatible can’t react fast enough in a battle and so they would end up dead. Therefore Jaeger pilots must either think a great deal alike or be related to each other. In the film one pair of Jaeger pilots are brothers and another is a father-son team. The Chinese Jaeger in the movie is piloted by identical triplets. This is great, right? Duos or trios of protectors for Earth, going out into the ocean to battle huge monsters – totally cool! Right? Until the governments decide it’s easier to build a wall along the Pacific coastlines of the affected countries to contain the Kaiju, and then informs the Jaeger program it is getting scrapped. But when the wall is promptly punctured by a new, improved Kaiju monster in Australia, the governments say there is nothing to worry about; the wall will do its duty and the Jaegers will become obsolete, as planned. Yeah. Right. Nothing could ever go wrong with a plan like that. Needless to say, the Jaeger program doesn’t go away. They were built to fight and kill Kaiju, and the Kaiju haven’t been sent packing yet. Until the Kaiju are gone, the Jaeger program doesn’t plan to Rust in Piece. I would say more, but I don’t want to spoil the movie. Not in this post, anyway. However, while I enjoyed the film, I can’t give it a five star rating. The reason why? It’s too long. While visually appealing and containing acceptable science fiction, the movie falters in that del Toro didn’t sew the film together well. The actors and actresses perform flawlessly, and while the film does require a fair amount of time to detail the mechanics of the Jaegers, it is just too long for comfortable viewing. The film drags in between fight scenes and character scenes: one example is the last thirty minutes of the movie. Instead of wrapping up the film within the sensible fifteen minutes, the heroes have to spend half an hour killing the last attacking Kaiju and sealing the dimensional rift that let them into Earth in the first place. If I hadn’t wanted to see just how they did it, I think I might have walked out of the theater before the film even ended. I’m paraphrasing here, but he has a point. Who doesn’t want to be able to walk through a hurricane as though it were no more than a rain shower? 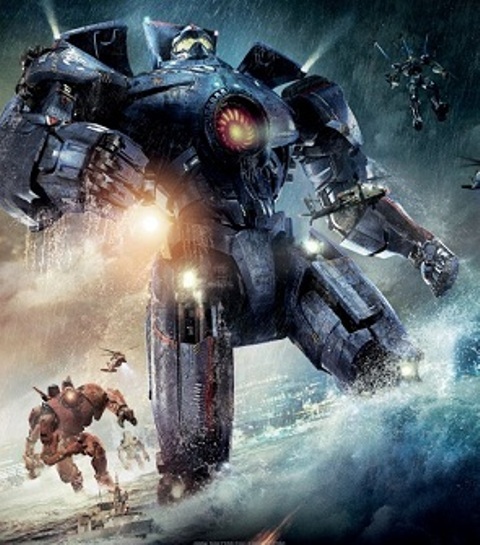 Michael Bay could take some pointers for his Transformer films from Pacific Rim. The Jaegers look more like Transformers than his ‘Bots and ‘Cons ever have, and they fight better too – albeit in slow motion. He could take a cue from PR to spice up his own Autobot/Decepticon battles. They are in serious need of work. So if I were to rate Pacific Rim, I would give it three stars out of five for the Jaegers, the titanic fight scenes, and the ‘Drift’/mind meld between Jaeger pilots. I’ll go back to the Drift later, when I get to the other part of the film that impressed me. This entry was posted in Movie Reviews and tagged Charlie Hunnam, Jaegers, Kaiju, Mako and Raleigh, Movie Reviews, Pacific Rim, Power, Rinko Kikuchi on March 20, 2014 by The Mithril Guardian.